Face2Face Business Campus is an area dedicated to meetings, exchange of ideas and cooperation. It is a place that integrates and provides an opportunity to jointly face greater and greater challenges every day. Sagittarius Business House is a modern A class office building with 24,900 sqm of leasable area. 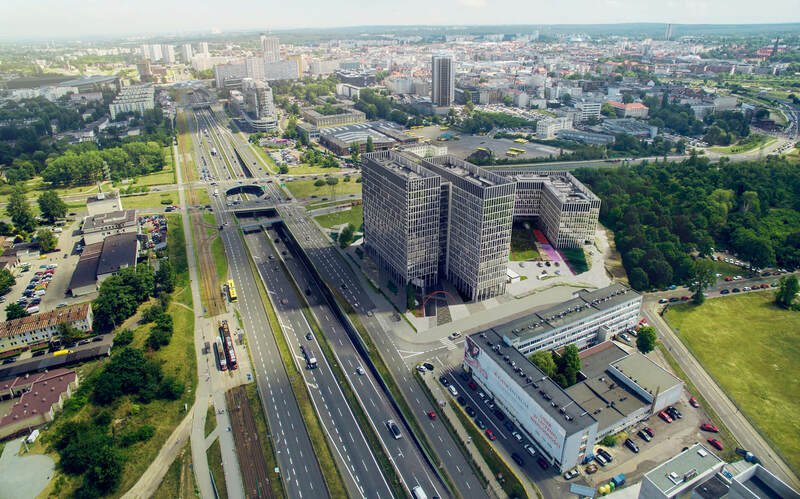 The project is located at the junction of Borowska and Sucha streets in Wrocław. 220 of your favourite stores, comfortable offices, around 50 restaurants and cafés, a new cinema in Bielany, a trampoline park, a fitness club, a medical centre. NOWA DZIELNICA is a residential estate for people looking for peace who also value life in the city centre. This is a place for demanding and aware of their needs residents. Each of you will find your space here and you can share it with others when you want to. Business ergonomics is an idea that accompanies us during each stage of preparation and construction of office projects. The complexity of our activities means that we provide our clients with the highest quality at every stage. Rydla 32 is a small residential complex that consists of two three-storey buildings. Its simple shape and large windows integrate perfectly with the natural landscape of this place. The green surroundings make our project an excellent choice for those seeking peace in the heart of the city. Libero is a new, exciting place on the retail map of Katowice – a fresh look at shopping, entertainment, recreation and sport. It is a friendly and comfortable space designed in a thoroughly modern way but with a classic aesthetic approach. Osiedle Jarzębinowe is an ideal place for people who want to live in a quiet and modern environment. The Manufaktura shopping centre, Piotrkowska Street and Nowe Centrum Łodzi – an area which will become a centre of cultural and artistic events after its revitalization – are located nearby. Osiedle Perspektywa is a modern residential complex located on Sielawy Street in Poznań's Naramowice district. Each of the residents can rest among greenery and recreational areas that guarantee a perfect perspective every day. Live in a place designed with attention to every detail. Osiedle Jaśminowe is a complex of 14 small multi-family buildings with internal roads, playgrounds and rest areas. Widoki Mokotów is a luxury apartment building surrounded by its own garden, designed in a cascade system and carefully finished with natural materials. Located on the edge of the historic Morskie Oko Park, it offers all the charms of Mokotów. ZEBRA is a bit like a horse but not quite. And this is what our new project is like. Its modern architecture with impressive black and white façades makes Zebra an exciting place to live in. You can sense peace here without giving up on the city centre. We are launching the construction of a new residential project on Gdańska Street in Wrocław. The entire complex will consist of apartments and flats that will fill the new buildings and the historic Albert Grau's palace. Osiedle Re:set is an enclave of peace, like the green Shire in the centre of the famous Mordor – the largest business centre in the country. You will really feel at home here! A complex of small multi-family buildings in Wrocław’s Krzyki district. Grota 111 is an asylum for residents. Cleverly designed road systems and rest areas for children and adults make everyone feel good.